Parkinson’s is a neurological disease, it is progressive in nature. Nerve cells in the brain die, resulting in the body is not producing enough dopamine. Dopamine is the “post person”, it is a neurotransmitter delivering messages from the brain to the body, allowing communications in the nerve cells and nervous system to take place. In the case of Parkinson’s disease this is movement, and the brain cells die or are slowly dying, this means less dopamine is available to get the signal down to the nerve cell. Imagine the difference between running on flat ground and then through water, you are slowed down somewhat. This happens to the messages the brain is sending to the body: move your arm, pick up that glass. The action is slower and not as smooth as a person without Parkinson’s. There are many different symptoms to Parkinson’s. For example, speech and writing change, impaired posture and balance, perception of distance/space, like putting a cup back onto the table. The main three symptoms associated with Parkinson’s are tremor (shaking), slowness of movement and the rigidity of muscles (stiffness). Research on exercise and Parkinson’s is showing many positive benefits for subjects with Parkinson’s disease. The research is shown that there are selective benefits from exercise and the type of exercise you do will depend on your symptom and severity of Parkinson’s. The milder your symptoms the more vigorous and broader your selection of exercises may be, the more severe and complex your symptoms become the more specific your exercise selection may be. Research is also showing higher intensity exercise to be more beneficial to slowing the progressions of Parkinson’s disease, the same way a drug would, when compared to a moderate intensity exercise regime. This study had subjects perform 4 sessions a week on a treadmill, with one group keeping their heart rate between 60-65% heart rate max (moderate intensity) and the other at higher intensity of 80-85% heart rate max. Using exercise as a means to slowing down the progressions of Parkinson’s is great news, as doctors can use this prescription for someone who has recently been diagnosed with Parkinson’s. Why would they do this? As with all medications, as time goes on the positive effect of the medication slows down. Using exercise as a ‘drug’ to slow down the progression of Parkinson’s can help prevent the conditioning worsening for longer. The exercise benefits for someone with Parkinson’s are the same as for someone without Parkinson’s disease – stronger muscles, stronger bones, healthier joints, improved mental and physical well-being, improved circulation, improved gait and healthier joints, as well as improvements in cognitive function. Exercise has shown to help the neuroplasticity can possible outweigh the effects of neurodegeneration. An exercise study has also shown benefits for people with Parkinson’s with improvements in their motor function, dexterity and coordination simply through exercising 30% harder than their voluntary speed on a cycle. If we go back to the three main symptoms of Parkinson’s, tremors (shakes), slowness of movement and rigidity of muscles (stiffness) we can see that with two out of the three exercises can help and be targeted towards. With clients at Body Happy, we look at fast explosive movements – fast feet drills, medicine ball drills and sprints on a bike/rower to help improve the speed of movement as well as exercise at a higher intensity. We then also focus on mobility exercises, pre-workout and during the workout as an active recovery exercise between resistance training sets. We also use foam rolling, muscle release techniques and stretching, post workout and during the workout to work on range of movement and reduce the rigidity of a muscle. It would appear that symptoms of Parkinson’s generally are similar, but they could be different. The following example looks to strengthen the muscles of the back, correcting posture, whilst looking to loosen the muscles around the shoulder joints and hips. These muscles are the ones that often get rigid. The muscles we want to lengthen and open up include the chest muscles, shoulders and neck muscles. These all pull the shoulders forwards, causing the rounding/hunched look. We also want to lengthen the muscles of the upper back. In the rounded/hunched over position, the muscles of the back become lengthened and weak. We want to strengthen theses muscles, in order to pull us back up into a better posture. 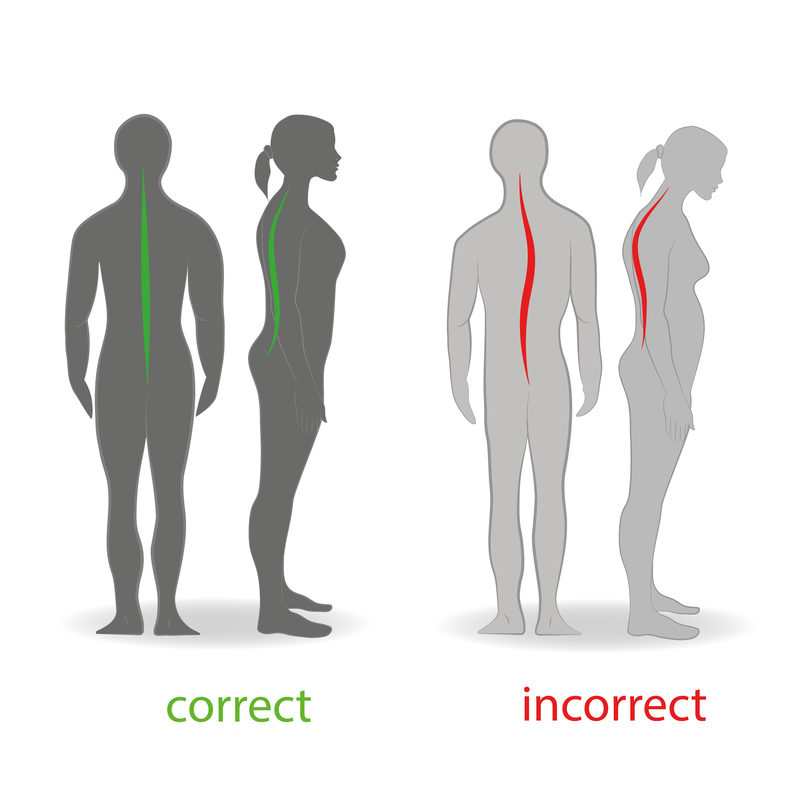 From the image on the left you will see the shoulders rolling forward, neck bent forward, and the right shoulder hiked up from the rear view for incorrect posture. As well as stretching and strengthening people with Parkinson’s may want to look at having regular massages to release the tension in the muscles. These can be done at home using foam rollers and also using a technique called trigger pointing. When looking at an exercise, with have to consider that client. Yes, in an ideal world we want everything to look like it should do in a text book – A* technique. When training someone with Parkinson’s you have to consider the limitations that the individual has and then work around these whilst pushing them on. I use a mixture of two hand and two leg exercises as well as single leg and single arm work. I want to make sure that the dominant arm is not doing all the work. For example, on the bench press with a barbell, I look for depth and straightness of the bar when lowering and pressing up. What I have noticed with a few of my clients, is not a lack of movement on the more effected side, but an over-compensation on the better side, they tend to overreach. So, in order to load we use compound exercise to work in a lower repetition range and single arm exercise to work in a higher repetition range. I always ask how they feeling and what kind of day they are having. As with everybody people with Parkinson’s have good days and bad days, and so on bad days I adjust the exercise slightly. I don’t necessarily take it easy on them, I’m simply adjusting the exercise selection. As the research shows, exercising at a higher intensity is better, so it is worth pushing them to their limit for that day. Create mind and body connections. The brain is a powerful thing, so push your clients and give them goals to achieve, as they are likely to buy into certain exercises over others. Use these exercises to push them and show them what they are capable of; show them how hard they can work and what is achievable. Having talked to the people I train with Parkinson’s, there is a fear factor to some of the exercises – especially going for a run, as they feel they are at a greater risk of falling. What I do as an instructor is make sure they are in a safe environment, that they feel safe and that they trust the exercise and/or exercise progression is achievable but difficult. If you click on the link below you will be able to download a PDF off a few mobility and flexibility exercises to do at home. There are not strength exercise attached as most home bodyweight exercises target the muscles we want to lengthen and neglect the ones we want to strengthen. If you are thinking of working out at home I recommended getting a strength band as this will help you work the muscles of the back with banded rows and pull aparts, as well as many more.